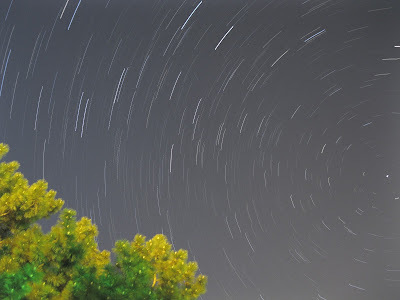 Point and shoot star trails are definitely possible! I've been jealous of everyone's amazing DSLR photos of star circles, and I didn't think I'd ever be able to make my own. After reading my camera manual in great detail (and with the benefit of stacking software) I managed to get my first star trail picture! 54 images stacked using StarStaX, taken between 11pm-12am April 28, 2012. PowerShot A3100 IS, 15 sec exposure, ISO 800. I taped the shutter button down with a mechanical pencil eraser. In hindsight I think ISO 800 was a little high, and I might tweak the final product a little in photoshop. But for now I'm just too excited! And yes I finally own a tripod, I got this one from Walmart for $14. It's a Targus TG-42TT 42-Inch 8-Section Travel Tripod, and I think it makes my camera look like a miniature Sputnik.